I can’t be the only one who thinks that was kind of a giant mess. Conceptually, the idea for the episode works: Get everyone on Silas’ magical island in search of the cure, explain a heap of necessary back-story, and put all the pieces in place to carry out the plan. This is classic The Vampire Diaries stuff, the kind of plot the show should be able to do in its sleep by now. But it’s the execution of the idea that’s lacking, almost as if some alien life form watched a ton of past episodes and attempted to recreate the show based on what they’ve seen. Thursday on The CW, it’s The Bizarro Diaries! After inching toward the cure discovery all season—a story that actually developed really nicely in the first half of the season—the quest has now feels like it has overstayed its welcome, dragged out at least one episode too long here while the characters listlessly roamed a tiny Canadian island with basically no purpose. This was basically inevitable, seeing as there are at least three different factions with their own cross-purpose for finding Silas and the cure amongst the seven who roam the island. Everyone wants the cure for their own purposes, except when they don’t want the cure at all. What started out as interesting narrative complexity breaks down into near unintelligibility here, with the only obvious outcome being that no one is likely to get exactly what they want. Why? Because something far more nefarious is going on with this Silas fellow. Of all the things that happened tonight, perhaps the most important for the story going forward was the least interesting thing on its face: Shane’s story about how he found out about Silas in the first place. Everything Shane learned about how to raise Silas and bring about the cure came from the ghost of his dead wife, whom he found in a magical cave. Silly? Sure. But more than silly, it’s the perfect example of an unreliable source. How does Shane even know that was his wife? More likely, it was just Silas using his wife’s likeness to dupe him into unleashing his terror upon the world. Considering all the buildup to meeting this Silas, to have him be anything less than a completely evil mastermind will likely be a disappointment. While everyone was blindly wandering around the island looking for each other and/or Silas’ magical well of resurrection, there was plenty of time for talking, and that’s where a lot of this episode went wrong. Most pivotal of these scenes was Elena and Damon’s discussion of the cure and what it means to their relationship. This is a scene that’s been a long time coming, as both of them have been dancing around the consequences of this cure for quite a while. The issue: Damon doesn’t want the cure—for him or for Elena—and Elena wants them both to take the cure and grow old together. Damon rightly points out that’s not him; that’s Stefan, and if she wants that, she might be better off doing it with him. There are issues piled upon issues in this conversation, but the biggest is how Elena reacts to Damon’s rejection of the cure. For all of the focus on the cure this season, this is the first time Elena has expressed her actual feelings about taking the cure. Knowing what she thinks (instead of everyone else assuming her feelings for her, as has been happening for weeks) is a great thing. It’s her treatment of these feelings in relation to Damon that feels off. Elena Gilbert is a passionate person, a defender of what she believes, and someone who is excellent at communicating those beliefs to the person she loves. In this conversation with Damon, though, she just felt sad, like a little girl begging her boyfriend not to leave her and to love her for just a little bit longer. Even though it’s in reaction to Damon saying they’ll never work as a human/vampire couple so desperation might be called for, it just doesn’t feel like Elena; it reeks of being tainted by the sire bond, which still hangs over her character and their relationship in a negative way. Meanwhile, the most interesting pairing on the island is Stefan and Rebekah, who have a solid conversation about how they each want to be cured. Rebekah, who becomes a better character every week, seems to have fully accepted her misery as a vampire and just wants to attempt to be happy as a human, with human things. Stefan wants to rid himself of the guilt 149 years as a vampire has given him and start over as a human for himself, not for Elena. These are good, character-illuminating reasons for wanting the cure, reasons that tell us more about them than we knew before, and that’s what makes their confession scene work, a speck of great in a sea of mediocre. Even the off-island story was a bit tired this time. It started out strong, with Tyler relentlessly torturing the captive Klaus, highlighting the really fun antagonistic chemistry between Michael Trevino and Joseph Morgan. Its evolution into yet another moment where Klaus needs to prove his humanity by putting Caroline in danger just to prove a point to Tyler, and then ultimately saving her, is where it disappoints. Listen, Klaus and Caroline are great together and in a world where this Originals spinoff didn’t exist, I’d say they might have a future. But knowing what we do, this felt like nothing but a bit of a tease. The one thing this story does prove is how great of an asset Joseph Morgan is as an actor, and how much I want the Originals spinoff to work so he can get a chance to stretch his wings a bit. 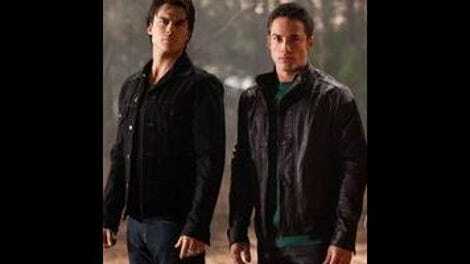 Klaus is a great character and Morgan a superb actor, but Mystic Falls is just too small for him to last much longer. Ultimately, though, what’s most disappointing about this episode is how tame the island setpiece turned out to be. Everyone spent most of the time being filled in on back-story, or wandering about in search of the kidnapped Jeremy. As it proved with the amazing “Klaus,” the show can do backstory in a way that feels fresh, exciting, and compulsively watchable, but this wasn’t it. With everyone broken up into three separate factions—Shane, Bonnie, Jeremy, and Jeremy’s weird kidnapper; Stefan, Elena, and Rebekah; and Damon and the mysterious new hunter—things are bound to get a bit more crazy next time. I hope. The cure is in Canada? Okay, then. There was so much Shane, Silas, and the magical well of resurrection exposition this week I could barely keep up. One thing that does seem clear is another 12-person sacrifice is in order. How many people are on the island right now? Bonnie is basically, “So, yeah, your wife died doing this magic you’re teaching me? Okay. Which way is the well?” Come on, Bonnie. At least your fiery locator spell was nifty. Jeremy’s mysterious kidnapper was just odd. He’s obviously one of Shane’s crew but this was not set up well at all.